The Bobbilicious Files: Remember This? I showed it to you a while ago. It's from Whirling turban in a style that may not be available anymore but was expensive when it was. It's a cool dress - two pieces and each piece is reversible so it has different wearing combinations. Well, look what I found! 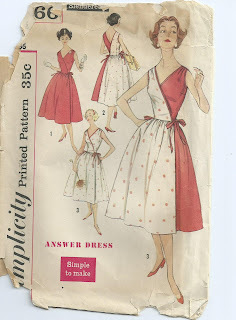 It's Simplicity 2466, a slenderette answer dress. I'm so excited! The envelope and instruction sheet are in terrible shape. 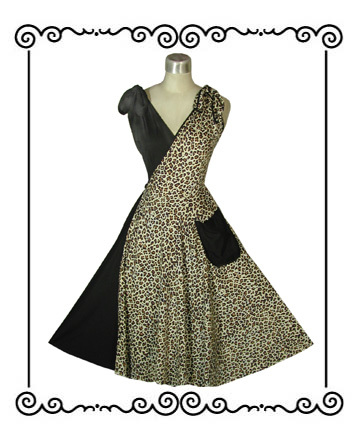 I need to find some sort of laminating sheets to protect them and keep them from getting worse and then I'll need to find a way to protect the actual pattern pieces...but I can make my own cool leopardy wrap dresses! It will take some finagling and experimenting but I'll figure out how to make it happen. I need to do some fabric research, too, to find out what will give me the right drape and look. I'm still working on my DVF Simplicity wrap. I have a wearable muslin done but it still needs some adjustments. I'd love to make it in a crazy print, something similar to what an original would be made out of but in colors that I would wear. I'm working on some more Bossa Nova skirts, too. I wore my daisy skirt the other night and got so many compliments! I'll have to schedule more sewing time into my days to finish everything that I want to do - not to mention the knitting projects I'm working on! Sigh. But first I have to try to work on this computer. Wish me luck!